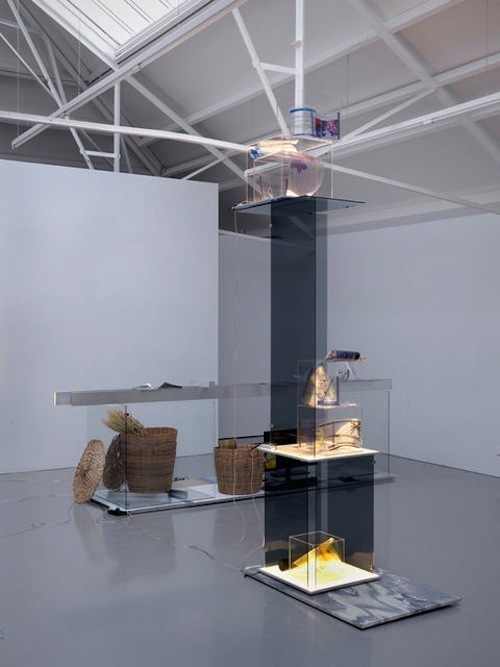 David Jablonowksi, Prediction Tower, Hype Cycle 2, 2014, glass, transparencies, dried rye, Plexiglas, marble, LED light panel, magnifying glass, dried fruit, acrylate, dimensions variable. Upon our entering David Jablonowski’s exhibition “Hype Cycle,” two works immediately stand out. Positioned throughout the gallery are the “Prediction Towers” (all works 2014), see-through column-like sculptures that comprise a wide variety of elements such as prints and organic materials, while in a corner is a rather large old wooden cart of the type you might imagine being pulled by horses and stacked high with hay. The wagon, New Trade Routes, Trade Alert, has been adorned with LED panels, multilingual writing, and fake Asian food items, pointing to the artist’s exploration of commerce, advertising, world economies, and the role of technology therein. Even the exhibition’s title refers to a graphical tool used to represent the maturity, adoption, and social application of technologies. Digital and physical, obsolete and state of the art, natural and technological: these are the seemingly contradictory components that we have come to know as central to Jablonowski’s practice. In this show, these ideas are played out on a physically larger scale as well as in a more ambitious layering of concepts and questions. The artist’s work mirrors and investigates our information society chaos in which we can get lost in a web of hyperlinks, news, data, and the visuals that frame such information. The work Big Data (Volkszählung), Copy 2, for instance, reflects on these ideas, featuring data printed on transparent sheets with a plaster sculpture inside two clear Plexiglas boxes. His world is one that is unmistakably of the present—celebratory of our current networked condition but also hinting at the possibility of environmental, structural, or personal collapse due to data overload and the speed of technological progress.